Situated in the business district, this hotel is within 2 mi (3 km) of Aberdeen Mall, Tournament Capital Centre, and Thompson Rivers University. The hot tub was amazing, staff were polite and helpful. Bed was crazy comfortable especially by hotel standards! Only reason i gave less stars is when we went in our room there was pillows on the floor and a few missed Things by housekeeping. I would definitely recommend this hotel though because regardless of those little things it was mostly really clean and well kept. Comfy bed. Breakfast food was good. Nice convenient location to the highway. Where to find Monte Creek hotels near an airport? 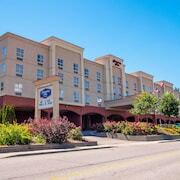 Where can I find hotels in Monte Creek that are near tourist attractions? Arranging time in Kamloops and want to stay in or near Monte Creek? Monte Creek features 2 quality short-stay and long-stay options within easy driving distance of its central area. There are some Expedia-listed accommodations within a 10 kilometres (6 miles) radius, like the South Thompson Inn & Conference Centre and South Thompson Inn Manor House. The The Residences at Sun Peaks Grand is positioned 25 kilometres (17 miles) away from the heart of Monte Creek. Another option is the Crystal Forest by Bear Country, which is located 25 kilometres (17 miles) away. Alternatively you could check out the rates and amenities at the Kookaburra Lodge by Bear Country or the Sun Peaks Grand Hotel & Conference Centre. Once you have got a feel for Monte Creek, why not travel a bit more of the area? 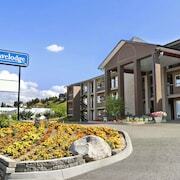 The Thompson Okanagan district has a number of attractions. Photographers will love Thompson Okanagan's rural landscapes. In addition you could visit the area's old towns and history museums. Fun-loving travelers might also enjoy snowboarding, skiing and cross-country skiing here. Looking for more to do? Why not spend the day visiting Merritt Golf and Country Club and Nicola Valley Museum and Archives, which you'll find in Merritt, 80 kilometres (51 miles) to the southwest of Monte Creek. 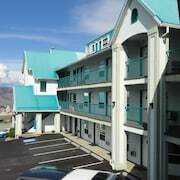 The Quality Inn and Super 8 Merritt are a few of the great apartment and hotel alternatives in Merritt. 95 kilometres (60 miles) to the west of Monte Creek, you'll also find Cache Creek, home to the Sandman Inn Cache Creek and Motel 6 Cache Creek BC. Regardless of whether you're passing through or spending a few nights in Cache Creek, set aside some time to check out the Semlin Valley Golf Course and Arrowstone Provincial Park. Why not spend an afternoon rubbing shoulders and cheering along with fellow sports fans at a local game. You'll find Prospera Place 90 kilometres (56 miles) to the south of Monte Creek. For travelers who are keen on staying close by, make a reservation in the The Royal Private Residence Club or Delta Hotels by Marriott Grand Okanagan Resort. Look up Expedia's current Monte Creek travel guide and discover the many scenic and cultural attractions that this area offers visitors. 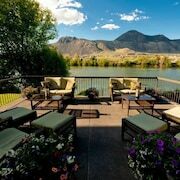 What are the most popular Monte Creek hotels? Are there hotels in other cities near Monte Creek? What other types of accommodations are available in Monte Creek? Explore Monte Creek with Expedia.ca’s Travel Guides to find the best flights, cars, holiday packages and more!